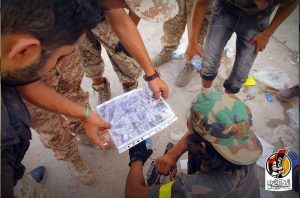 In renewed fighting today Bunyan Marsous commanders say they forces have succeeded in splitting the terrorists’ last enclave in Sirte’s Third District. Fighters led by tanks and armoured cars have driven through a gap between the Lighthouse area and the 600 Buildings in Marine Giza. The extent of BM casualties in this latest assault against IS has not been given by the operation’s media office. At least 560 largely Misratans have died in the fighting since May with more than 2,750 injured. With every new assault on IS positions there is the expectation that the fight will finally be over. In August, before the Ouagadougou Centre was finally overrun, there was a general expectation that this would be the location where the IS terrorists would make their last stand. International news teams hurried to Sirte to watch the anticipated end. In the event IS has retreated house by house exacting a sad toll on BM forces, many of whom still have limited military skills and fall prey to sniper fire and booby traps. However, the terrorists’ ability to wreak havoc with car and truck bombs appears to have been radically reduced if it has not been ended completely. Earlier this week BM fighters found a truck bomb loaded with shells which had been abandoned when it became stuck on a sandy beach. Nevertheless, the ambush last week near the Ghadabiya air base in which eight BM fighters and the Dutch photographer Jeroen Oerlemans died demonstrated that IS still has the ability to mount attacks from the outside of the cordon that has closed around their fellow terrorists in the town itself.